The sense of smell is closely related to memory. 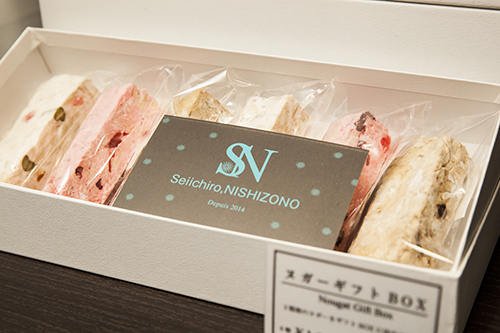 I am aiming at making sweets which not only feature smell, are beautiful to a person’s eyes, and are delicious to eat, but also add the scent remaining in memory. 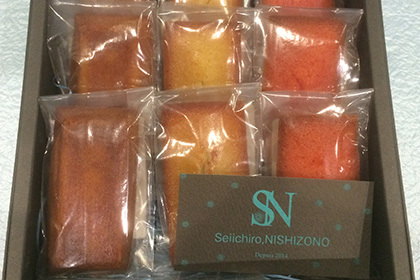 Instead of butter, homemade aroma oil is used for the financier as shown in the photograph, and there are variations according to seasons. 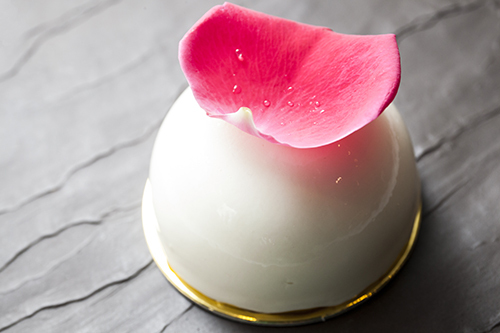 One piece of sweets which combines the chestnut (maron) with framboise and a rose on the theme of “unexpected encounter.” Into the pure white mousse of white chocolate which smells of rose, the gelee of the framboise of acidity with a sufficient degree is contained. This cake is a chef’s masterpiece which has been made since school days. It has been made in modern style the excellent cake of France Montelimar by the way of cutting almonds or degree of roasting. This is the specialty of the chef introduced by various news media immediately after the opening. Copyright © Seiichiro,NISHIZONO All Rights Reserved.